Kids and Distracted Driving - Harrison White, P.C. Any parent knows that children in the car can be a distraction. However, most parents don’t know exactly how much of a distraction, and how dangerous distracted driving can be. A recent study from Monash University Accident Research Center showed that children in the back seat can be 16 times more dangerous and distracting than driving alone. Despite the fact that distractions contribute to a significant portion of crashes, South Carolina has absolutely no laws in place at this time prohibiting distracted driving. In 2012, there were 863 fatalities in South Carolina, and approximately 10% of those involved a distracted driver. Distracted driving doesn’t always involve device use, and passenger distraction is one of the top causes of car accidents. Of course, just leaving the kids at home isn’t an option. Parents need to travel safely with children. So how can parents reduce the dangers that driving with children can cause? While the dangers of cell phone use and driving can’t be ignored, children can be just as distracting. In the Monash study, parents took their eyes of the road for nearly 3 and a half minutes combined during 16 minutes worth of driving. At 50 miles per hour, that’s like driving 4 miles with their eyes closed. In the study, it was found that children were incorrectly restrained 70% of the time spent traveling. This increased the risk for the children during a car accident, as well as increased potential parental distractions. Making sure children are properly restrained during the entire trip could significantly cut down on distractions. During the study, 76.4% of drivers used the mirror to watch their children and not the road. The rearview mirror should be positioned to look at the road, and not as the back seat of the car. Simply by pointing the rearview where it is supposed to be, these parents could avoid significant distractions. In the study, the majority of the children involved were 1 to 8 years old. 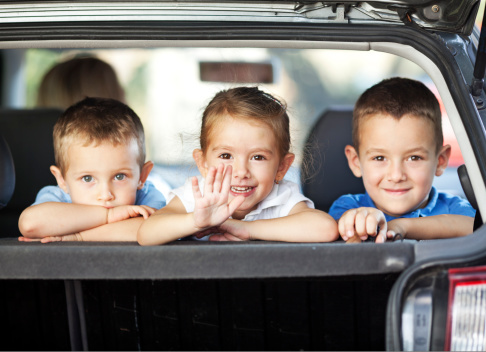 While toddlers may to too young to understand good passenger etiquette, children 5 to 8 should know how to behave in a car. There should be strict rules for behavior in the car, just like there are rules for behavior in the home. One problem parents frequently deal with is squabbling siblings. When possible, parents should seat their children with at least a seat between them, and use arm rests to create boundaries. This also creates room for age appropriate booster seats for children. There are certain types of distractions that cannot be completely eliminated. With cell phone, or handheld device use, users can simply put them out of reach to avoid the temptation. However, in a parent’s case, it requires self restraint to avoid being dangerously distracted by child passengers.